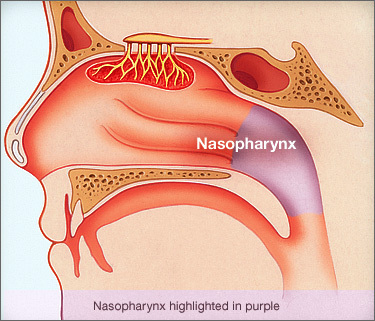 The nasopharynx is, by definition, the upper part of the throat behind the nose. It is a part of the pharynx, which comprises three separate segments: the nasopharynx, oropharynx, and the hypopharynx. The nasopharynx is 2 to 3 cm wide and 3 to 4 cm long and situated behind the nasal fossa inside the occipital bone. The nasopharynx is the space above the soft palate at the back of the nose and connects the nose to the mouth, which allows a person to breathe through the nose. The soft palate separates the nasopharynx from the oropharynx, which sits just below the soft palate. The nasopharynx remains open even when surrounding muscles flex so that the person can continue to carry on respiratory functions. The nasopharynx is surrounded by the salpingopharyngeal fold and tubal tonsils, which can become inflamed when infected. It contains adenoid tissue, which fights infection, and the openings to the Eustachian tubes, which lead to the ears. It provides a major drainage path for lymphatic fluids and generally drains into the throat, nose or ears.